A wide variety of plants possess enormous treasure of medicinal value. Majority of these medicinal plants have been used to treat various systemic conditions successfully. Over the recent years, use of these medicinal plants has resurfaced to treat oral conditions. Among the oral conditions, periodontal disease remains one of the most common. Alternative and preventive options has become the need of the hour in order to overcome the adverse effects of the antimicrobial agents used in large as an adjunct to mainstream periodontal treatment. Punica granatum (Pomegranate) is one of the oldest edible fruit which has a long history as a medicinal fruit. This review is an attempt to highlight the potential of Punica granatum as a preventive and therapeutic aid to periodontal disease. Recent advances in periodontal plastic surgical procedures allow the clinician to reconstruct deficient alveolar ridges in more predictable ways than previously possible. Placement of implant/s in resorbed ridges poses numerous challenges to the clinician for successful esthetic and functional rehabilitation. The reconstruction frequently utilizes one or combination of periodontal plastic surgical procedures in conjunction with autogenous bone grafting, allogenic bone block grafting, ridge split techniques, distraction osteogenesis, or guided bone regeneration (GBR) for most predictable outcomes. 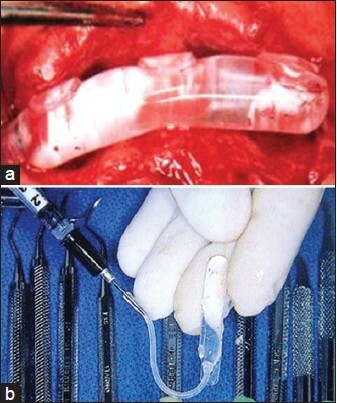 Current surgical modalities used in reconstruction of alveolar ridge (horizontal and/or vertical component) often involve the need of flap transfer. Moreover, there is compromise in tissue integrity and color match owing to different surgical site and the tissue utilized is insufficient in quantity leading to post surgical graft exposition and/or loss of grafted bone. Soft tissue expansion (STE) by implantation of inflatable silicone balloon or self filling osmotic tissue expanders before reconstructive surgery can overcome these disadvantages and certainly holds a promise for effective method for generation of soft tissue thereby achieving predictable augmentation of deficient alveolar ridges for the implant success. This article focuses and compares these distinct tissue expanders for their clinical efficacy of achieving excess tissue that predominantly seems to be prerequisite for ridge augmentation which can be reasonably followed by successful placement of endosseous fixtures. Objectives: (i) To assess reduction in Streptococcus mutans and Lactobacillus species count in saliva sample after ten minutes of oil gum massage therapy (massage of gingival tissues) per day for three weeks with sesame oil, olive oil, and coconut oil in three different groups of subjects. (ii) To compare the efficacy between three different oils and the "gold standard" chlorhexidine gel. (iii) To assess reduction in gingival scores and plaque scores of study subjects. Materials and Methods: Study design - Single center, parallel design, and triple blind randomized clinical study with four treatment groups. 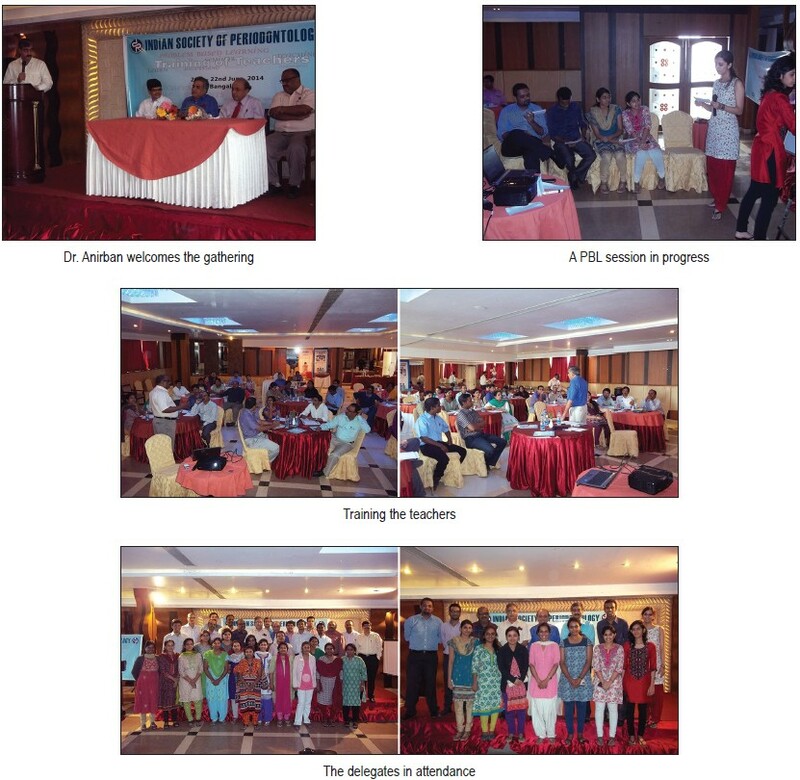 Participants: 32 of the 40 study subjects working as housekeeping personnel at Kasturba Hospital, Manipal; aged 18-55 years completed the three-week study period. Interventions: Subjects were randomly assigned to massage their gingiva everyday for three weeks with sesame oil, olive oil, coconut oil (tests), and Chlorhexidine gel (control). Oral health status and paraffin stimulated saliva samples were obtained at baseline and after three weeks of oil gum massage therapy. Outcome measures: Microbial culture, plaque index, and gingival index. Statistical analysis: Paired t test and Kruskal Wallis test. Results: There was a significant reduction in mean Streptococcus mutans count, Lactobacillus count, plaque scores, and gingival scores in all four groups after the study. However, there was no significant difference found in percentage reduction of these variables between the four groups. Conclusion: These oils can be used as valuable preventive agents in maintaining and improving oral health in low socioeconomic status population. However, it is recommended that further research should be conducted in other populations with a larger sample and longer duration of follow-up period. Context: Bacterial pathogens in dental plaque are necessary for the development of periodontitis but this etiology alone does not explain all its clinicopathologic features. Researchers have proven the role of certain viruses like herpes virus in periodontal disease which implies that other viral agents like human papilloma virus may also be involved. Aims: This cross-sectional study was conducted to determine the proportion of patients with human papilloma virus (HPV-16) in marginal periodontium by analyzing DNA from the gingival tissue sample and to understand its association with periodontitis. 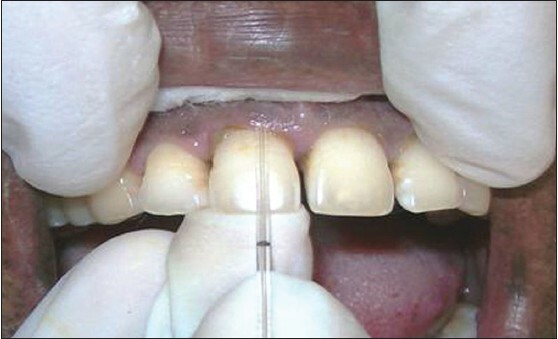 Settings and Design: 102 systemically healthy patients between the age group of 15 and 70 years reporting to the Department of Periodontology who required surgical intervention (flap surgery for patients with periodontitis and crown lengthening for healthy patients) with internal bevel gingivectomy were selected. Materials and Methods: After scaling and root planning, gingival tissue was collected during the respective surgical procedure. DNA was isolated and amplified using specific primers for HPV-16 by polymerase chain reaction (PCR). The amplified products were checked by agarose gel electrophoresis. Results: No HPV DNA was detected in the 102 samples analyzed. Conclusion: Marginal periodontium does not contain HPV in this study population and hence there was no association between HPV and periodontitis. Aims and Objectives: The present study was designed to estimate and compare the superoxide dismutase and total antioxidant capacity levels in the serum of diabetes mellitus - Type 2 patients and healthy individuals with and without periodontal disease. Materials and Methods: The study was designed as a case-control study comprising of 150 subjects, inclusive of both genders in the age group of 35-65 years. They were divided into three groups of 50 patients each. Patients were categorized into diabetic with chronic periodontitis (DM-CP) and systemically healthy groups with and without periodontitis. Serum samples were collected and sent for biochemical analysis to estimate the total antioxidant capacity (TAOC) and superoxide dismutase (SOD) levels. Results obtained were then statistically analysed using ANOVA test. Results: The results showed a higher level of serum TAOC in the systemically healthy group without periodontitis (PH) compared to the other groups. The P value was found to be <0.05. The SOD levels were found to be highest in the DM-CP group. Conclusion: The results of this study indicate that serum TAOC were found to be highest in the PH group and lowest in the systemically healthy with chronic periodontitis (CP). The serum SOD levels were found to be highest in the DM-CP group. The increased levels of SOD seen in DM patients may be a result of a protective and adaptive mechanism against the oxidative stress developing in the tissue. Background and Objectives: C-reactive protein (CRP) is a type I acute phase reactant. A number of studies have reported elevated serum CRP levels in periodontitis subjects, which decrease following periodontal therapy. However, the data of interventional studies on gingival crevicular fluid (GCF) levels of CRP is very scarce. The aim of the present study was to evaluate the effect of periodontal therapy on GCF CRP levels in patients with gingivitis and chronic periodontitis. Materials and Methods: A total of 60 subjects were included in the study with 20 subjects each in following groups: I-Healthy, II-Gingivitis, III-Mild periodontitis based on community periodontal index scores. Periodontal therapy was performed on Group II and Group III patients. GCF was collected from each subject at baseline and 3 months after periodontal therapy. 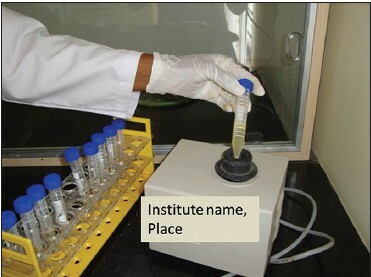 The collected sample was subjected to biochemical analysis to detect CRP levels by using commercially available chemiluminescence immunoassay kit. Results: The present study demonstrated that the periodontitis group had a higher mean CRP level (2.49 ± 0.47 ng/ml) when compared with the Gingivitis group (1.40 ± 0.32 ng/ml) and Healthy group (0.56 ± 0.20 ng/ml). The mean CRP values after periodontal therapy were found to be reduced to 0.44 ± 0.23 ng/ml in Group II and 1.30 ± 0.36 ng/ml in Group III patients. Interpretation and Conclusion: Within the limitations of this study, it can be concluded that GCF CRP level progressively increases from periodontal health to disease. It can also be stated that there is a decrease in GCF CRP levels with periodontal treatment. Background and Objectives: Coenzyme Q10 is a well-studied antioxidant in the medical literature, but studies regarding its efficacy in periodontal diseases are few. coenzymeoenzyme Q10 serves as an endogenous antioxidant and its increased concentration in the diseased gingiva effectively suppresses advanced periodontal inflammation. The aim of this study is to evaluate the efficacy of coenzyme Q10 (Perio Q™) as an adjunct to scaling and root planing in patients with chronic periodontitis. Materials and Methods: A total of 18 patients were enrolled for the study. The selected subjects were treated in three different quadrants randomly. The control quadrant was treated by scaling and root planing only, while the other two test quadrants were treated by intra-pocket application of gel combined with scaling or root planing and topical applications combined with scaling and root planning, respectively. Clinical parameters such as plaque index, gingival index, gingival bleeding index and probing pocket depth were assessed at baseline and at the 2 nd week and 4 th weeks. The results were subjected to statistical analysis. Results: There was a significant improvement in all clinical parameters in the test sites seen at the end of the 4-week period. Sites with bleeding on probing were reduced more in the test group than in the control group. Conclusion: Coenzyme Q10 can be said to have a beneficial effect on periodontitis when used as an adjunct to scaling and root planing. Aim: The purpose of this clinical study was to evaluate the efficacy of saturated ethanolic solution of Propolis for the treatment of dentin hypersensitivity. Materials and Methods: Ten patients aged 20-40 years with 156 hypersensitive teeth were selected for a 3-month study . Each patient was subjected to treatment with saturated ethanolic solution of Propolis, 5% potassium nitrate and distilled water. The patients were recalled at seventh day, 2 weeks and 4 weeks for the application of the agent and re-evaluation. The final re-evaluation of the patients was done after 3 months from the first application. The responses of the patients to the test temperatures were converted to a ranking and data was statistically analyzed. A statistical analysis was done using ANOVA and Bonferroni test and Tukey HSD test for multicomparison. Results: The results between the Propolis group and the potassium nitrate group showed no significant difference in the immediate post-treatment period; however, the results were significant at the end of first week and second week. At 4 weeks and 3 months period, a comparison between the groups again showed no significant difference. Conclusion: It was concluded that Propolis was more effective than 5% potassium nitrate in relieving dentinal hypersensitivity and had an immediate and sustained effect. 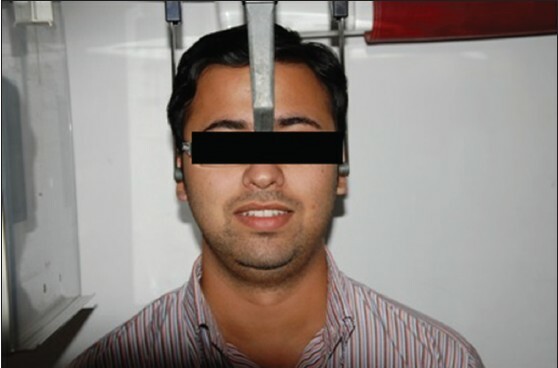 Background: The background of the following study is to measure the subjective intensity of pain using the verbal rating scale (VRS) during supragingival scaling in relation to mandibular anteriors, with an ultrasonic scaler, with 2 different inserts (Slimline and Focus spray)- split mouth study. 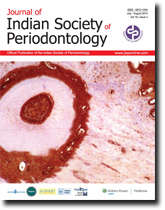 Materials and Methods: A total of 30 subjects with a combination of 17 males and 13 females with the chronic generalized gingivitis with a minimum calculus score of 1 (CSSI - Ennever J 1961) who reported to Department of Periodontics, Yenepoya Dental College, Mangalore were chosen for the study. 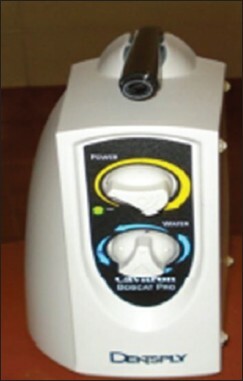 Ultrasonic magnetostrictive scaler unit CAVITRON BOBCAT PRO ® - (DENTSPLY) with maximum power setting at 130A and 25kHZ frequency with 2 different inserts i.e., Slim line insert and Focus spray (DENTSPLY) were used for supragingival scaling in the study. A VRS was used to assess the subjective intensity of pain. Results: There was no statistically significant difference in pain perception when the scores were compared using Wilcoxon signed rank test. VRS rating scores with slimline inserts showed a pain intensity of 2 in 43.3%, 1 in 53.3% and 0 in 3.3%, whereas the focus spray insert showed a pain intensity of 1 in 23.3% and 0 in 76.7%. Statistical analysis showed a P = 0.251 and a z - 1.147 a . Conclusions: The use of both Slim line insert and Focus spray inserts when used at same settings of the scaling unit, showed no statistical significant difference in the intensity of pain perceived and it showed no correlation between patient acceptance and their pain perception. 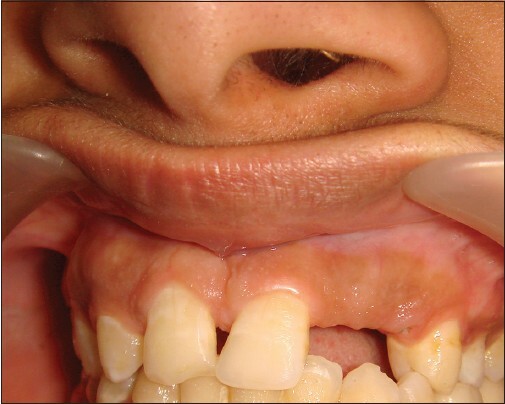 Background: There is a considerable intra and inter-individual variation in both width and thickness of the facial gingiva. As the attached gingiva is an important anatomic and functional landmark in the periodontium, the identification of gingival biotype is important in clinical practice since differences in gingival and osseous architecture have been shown to exhibit a significant impact on the outcome of restorative therapy. Hence, the aim of this study was to determine the variation in width and thickness of facial gingiva in the anterior segment with respect to age, gender and dental arch location. Materials and Methods: 120 subjects were divided into three age groups: The younger age group (16-24 years), the middle age group (25-39 years) and the older age group (>40 years) with 20 males and 20 females in each group. The width of the gingiva was assessed by William's graduated probe and the thickness was determined using transgingival probing in the maxillary and mandibular anterior segment. Results: It was observed that the younger age group had significantly thicker gingiva but less width than that of the older age group. 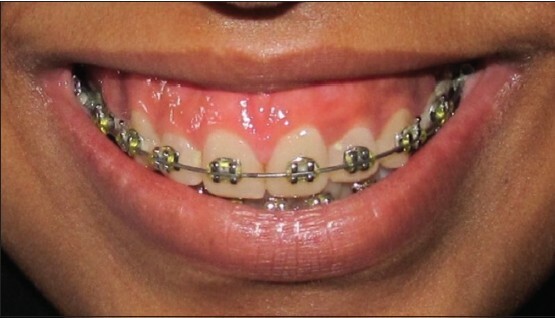 The gingiva was found to be thinner and with less width in females than males. The mandibular arch had thicker gingiva with less width compared to the maxillary arch. Conclusion: In the present study, we concluded that gingival thickness and width varies with age, gender and dental arch location. 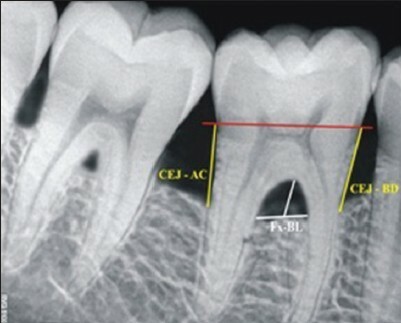 Background: Presence of furcation involvement indicates advanced periodontitis, and a potentially less-favorable prognosis, for the affected tooth and its diagnosis has always been an enigma. The present study was carried out to measure and correlate the interdental and interradicular bone loss in patients suffering from periodontitis using radiovisuography (RVG) for the purpose of early furcation diagnosis. Materials and Methods: A total of 50 patients suffering from chronic generalized periodontitis and with furcation involvement in mandibular molars were selected. Under standardized conditions, RVGs were taken and the morphologic measurements defining the furcation areas were recorded and analyzed. Result: Interradicular bone loss of about 0.8 mm or more, was observed in the study subjects only when the bone loss at the interdental area was minimal of 3.7 mm. The correlation between the interradicular and the interdental bone loss was statistically highly significant (T-test, P < 0.001). A stronger correlation was observed in subjects above 40 years of age as compared with the younger subjects. There was not much difference in the degree of correlation between the interradicular and the interdental bone loss when compared in the context of gender. Conclusion: The very first millimeter of interradicular bone loss was seen when the interdental bone loss was around 4 mm. 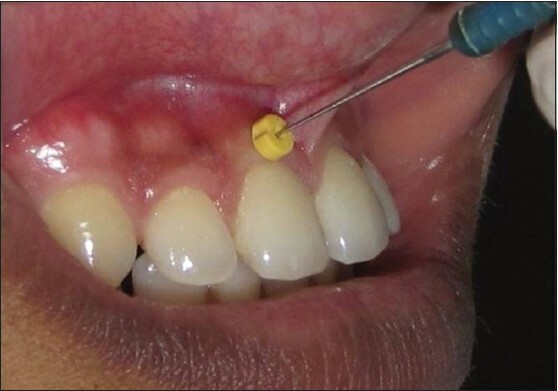 Therefore, to detect the earliest lesions of furcations, the interdental bone loss can be kept as an approximate guide for the comprehensive diagnosis and management of such sites/patients. The current investigation paves the path for future longitudinal studies with larger samples to ascertain these findings. Background: Need for having better esthetics is the new emerging trend seen in patients' demands and expectations. Various periodontal procedures including the mucogingival procedures have been designed to enhance the esthetics. The amount of gingival display of the patient is also an important parameter while considering the esthetics of the patient. Till date, very few studies have been done in which the amount of gingival visibility have been determined. So, the aim of this study was to evaluate the amount of visibility of gingiva during natural smile and forced smile in the patients visiting Himachal Dental College and Hospital. 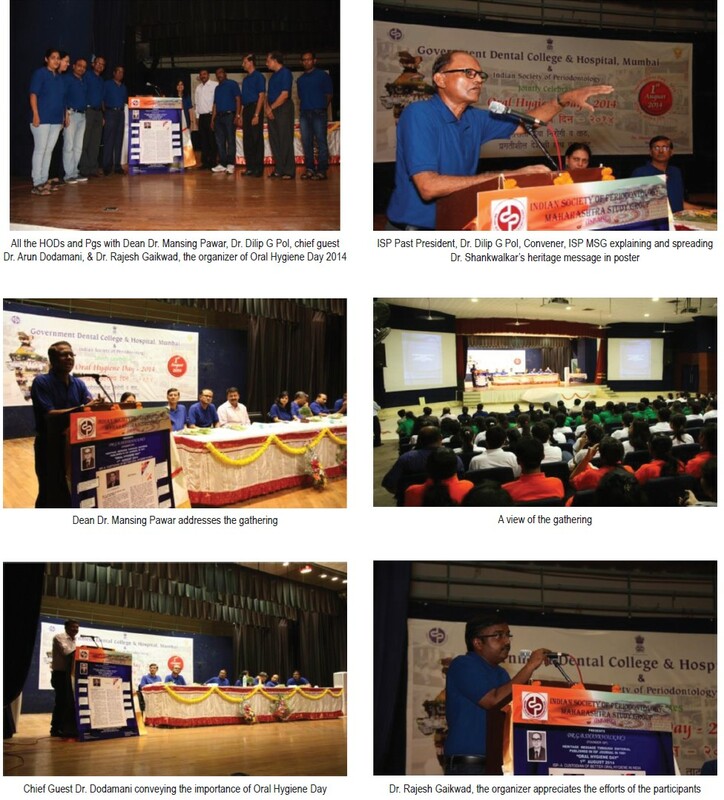 Materials and Methods: A total of 400 patients (242 females and 158 males), aged between 18 to 49 years, attending the outpatient department of Himachal Dental College, were included in this study. Patients were divided into two groups according to age and gender. Clinical photographs of the patients were taken and analyzed according to the following classification: (1) Very high smile line that is more than 2 mm of marginal gingiva visible or more than 2 mm apical to the cementoenamel junction visible for the reduced but healthy periodontium, (2) high smile line that is between 0 and 2 mm of marginal gingiva visible or between 0 and 2 mm apical to the cementoenamel junction visible for the reduced but healthy periodontium, (3) average smile line in which only gingival embrasures are visible, (4) low smile line in which gingival embrasures and cementoenamel junction not visible. Examination of the gingiva was done for both natural smile and forced smile. Results: During smile analysis, the following results were revealed for Natural smile and forced smile. Natural smile analysis revealed following: C1: 1%, C2: 6%, C3: 43.50% and C4 was 49.50%. Forced smile analysis revealed the following: C1: 1%, C2: 15.50%, C3: 59% and C4: 24.50%. 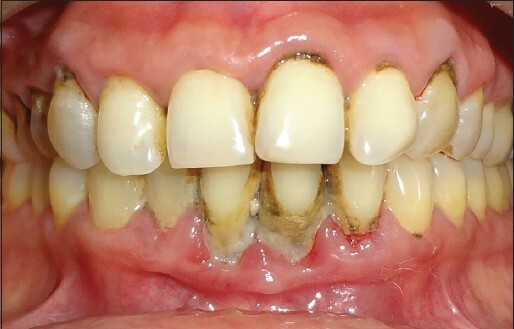 Conclusions: Excessive gingival display is an esthetic concern both to the patient and clinician. Therefore, understanding the etiology and treatment options is crucial for the treatment of such patients. So, it becomes utmost duty of the dentist to see that visual attractiveness of the smile is associated strongly with the health of the periodontium. Background: Regenerative procedures frequently include the use of barrier membranes and bone grafting materials to encourage the growth of key surrounding tissues. The present study aims to evaluate and compare the ability of periosteum in intrabony defect regeneration. Materials and Methods: A total of ten intrabony defects were equally divided in two treatment groups. Group I consisted of Periosteum used as a barrier memebrane and Group II of periosteum as barrier membrane alongwith graft material. 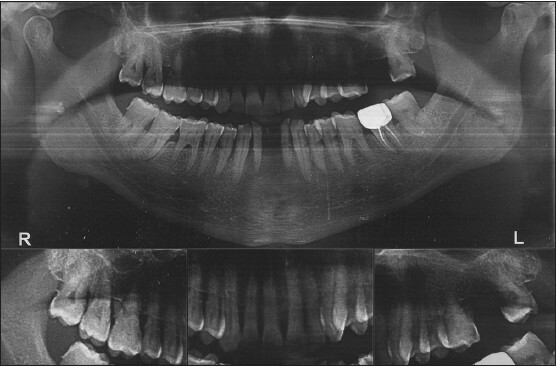 Nine months post operative evaluation of defect fill was done radiographically. Results: Mean defect fill (CEJ-BBD) was found to be significantly lower in Group II as compared to Group I (P = 0.041). Conclusion: Within the limitations of this study, alloplastic graft material supplimentation results in better regeneration with Periosteum used as a barrier membrane. 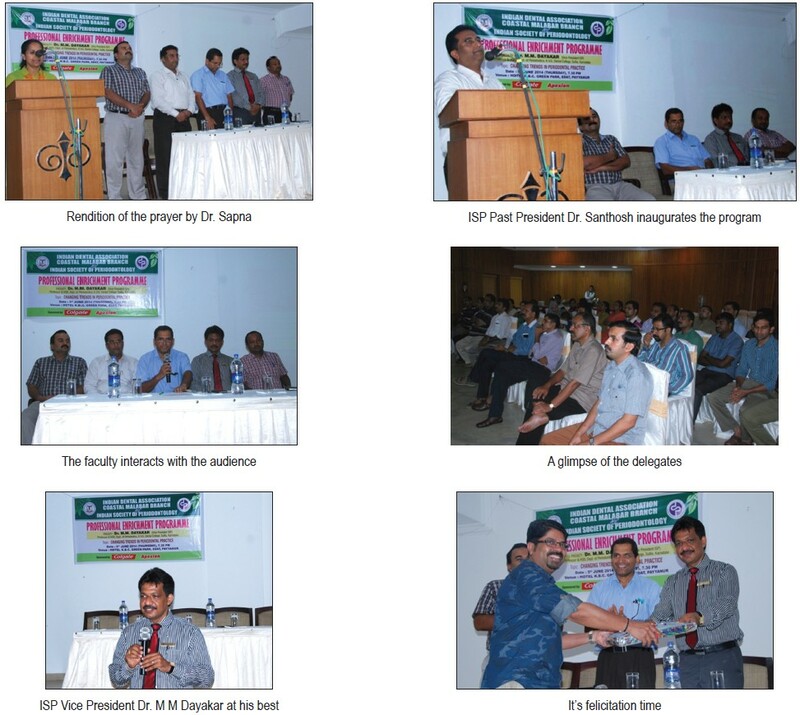 Aim: The aim of this study is to determine the morphological features and morphometrics of mental foramen with reference to surrounding anatomical landmarks in Coastal Andhra population of Andhra Pradesh State. Materials and Methods: Two-hundred and nineteen dry dentate and edentulous mandibles are examined in this study. Out of these 127 were dentate and 92 were edentulous. Various morphological and morphometrical parameters were measured by using digital Vernier caliper, metallic wire and metallic scale on both the right and left sides. 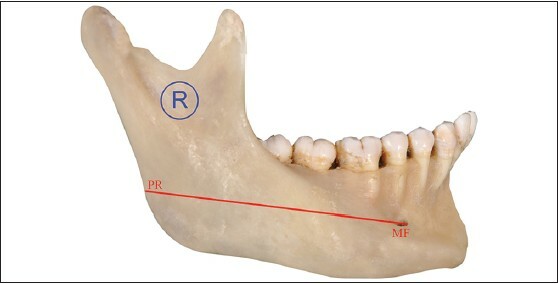 Results: In the present study, the distance between most anterior margin of mental foramen and posterior border of ramus of the mandible is [MF-PR], MF-PR is 69.61 ± 6.03 mm on the right side and is 69.17 ± 6. 0 mm on left side in dentate mandible. In edentulous type, MF-PR is 68.39 ±6.4 mm on right side and 68.81 ± 6.55 mm on left side. In the present study, the distance between symphysis menti and most anterior margin of mental foramen [MF-SM] in dentate mandible is 28.24 ± 5.09 mm on right side and is 27.45 ± 3.7 mm on left side. In edentulous mandible (MF-SM) is 28.51 ± 4.5 mm on right side and on left side is 27.99 ± 4.50 mm. Conclusion: Acquiring the knowledge and importance of anatomy of mental foramen is helpful in avoiding neurovascular complications, during regional anesthesia, peri apical surgeries, nerve repositioning and dental implant placement. Introduction: Exposure to noise rich in low frequency components induces abnormal proliferation of extracellular matrix and collagens. The previous studies have shown alterations in the periodontium of both humans and animals. Our objective was the evaluation of collagens I, IV and V of the periodontium of Wistar rats exposed to noise rich in low frequency components. Materials and Methods: 5 groups (each with 10 animals) were exposed to continuous low frequency noise (LFN). The LFN, from previously recorded white noise, frequency filtered and amplified, was applied in growing periods of 1, 3, 5, 9 and 13 weeks, in order to characterize the alterations with exposure time. A control group of ten animals was kept in silence. These animals were used in groups of 2 as aged-matched controls. After exposure, sections were obtained including teeth, alveolar bone and periodontium and observed after immunollabeling for collagens I, IV and V. Results: A significant increase in collagen I was observed in exposed groups (P < 0.001) (Kruskal-Wallis test). Post-hoc comparisons (Mann-Whitney test with Bonferroni correction) showed an increase in collagen I in animals exposed for 3 weeks or more (P < 0.001). The same test was applied to collagen V where significant differences were found when comparing control and exposed groups (P ≤ 0.004). The t-test for independent samples was applied to collagen type IV where no significant differences were found (P = 0.410), when comparing to the control group. Discussion: As in other organs, we can observe fibrosis and the newly formed collagen is likely to be "nonfunctional," which could have clinical impact. Conclusion: Noise may constitute a new comorbidity for periodontal disease. Ablative surgery of the jaws may be necessary when malignant disease or destructive benign disease occurs. Surgical reconstruction needs to include the restoration of masticatory function so that the quality of life after the operation is optimal. 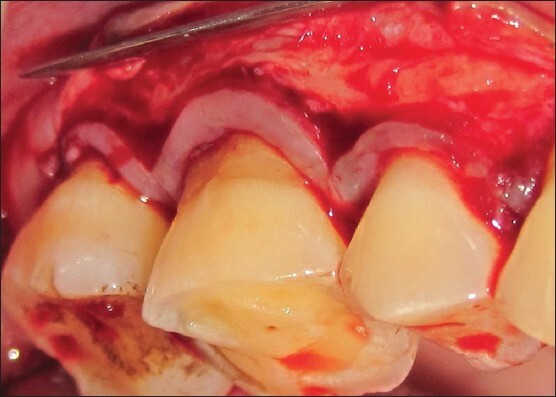 When resection includes part of the upper or lower jaw, the aim of reconstruction should encompass not only the restoration of aesthetics, speech and swallowing, but also the recreation of an alveolar ridge suitable for prosthetic rehabilitation of the dental occlusion. In the present case, depth of vestibule was inadequate following implant placement thereby severely compromising prosthetic rehabilitation. 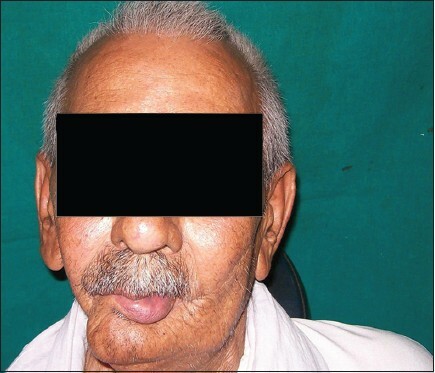 Hence vestibuloplasty was done with periosteal fenestration operation, which provided retention and stability of mandibular prosthesis and hence greatly improved his overall quality of life. The aim of the article is to describe a modification of the roll flap, performed at the implant second surgical stage, allowing the correction of small horizontal defects by enhancing the soft-tissue thickness and improving the buccal soft-tissue profile. The advantages for this modification lies in the fact to preserve the papilla morphology and enhancement of the soft-tissue esthetic results. Calcium channel blockers are widely used in medical practice for the management of hypertension and in the prophylaxis of angina. Gingival overgrowth is now a recognized unwanted effect associated with many of calcium channel blockers. This can have a significant effect on the quality of life as well as increasing the oral bacterial load by generating plaque retention sites. Amlodipine, a third generation calcium channel blockers has been shown to promote gingival overgrowth, although reported in very limited cases. The management of gingival overgrowth seems to be directed at controlling gingival inflammation through a good oral hygiene regimen. However, in severe cases, surgical excision is the most preferred method of treatment, followed by rigorous oral hygiene procedures. 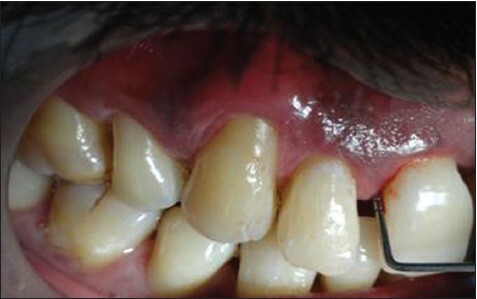 This case report describes the management of gingival overgrowth in a hypertensive patient taking amlodipine. Excessive gingival display, commonly referred to as 'gummy smile' is a major hurdle in overall personality of an individual. Gummy smile, secondary to altered passive eruption and tooth mal-positioning, can be predictably treated with Surgery and orthodontic therapy. In patients with jaw deformities, orthognathic surgery can be performed. However, this requires hospitalization and entails significant discomfort. Lip repositioning is a simple surgical procedure to treat 'gummy smile'. The procedure restricts the muscle pull of the elevator lip muscles thereby reducing the gingival display while smiling. This procedure is safe and predictable with minimal risk or side effects. 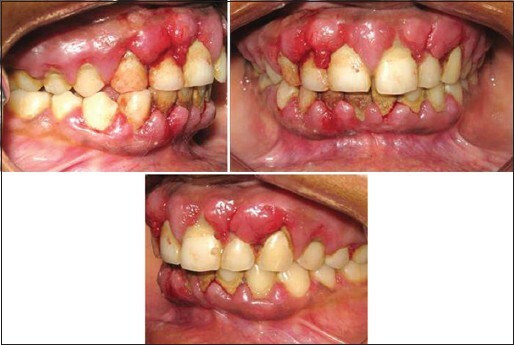 This case report describes the successful treatment of excessive gingival display using surgical lip repositioning procedure which can be used as an alternative treatment modality for treatment of excessive gingival display. Idiopathic hypoparathyroidism (IHP) is a rare endocrinopathic disorder, of idiopathic nature, characterized by a deficiency of parathyroid hormone causing low serum calcium (Ca) and high serum phosphorus concentrations. 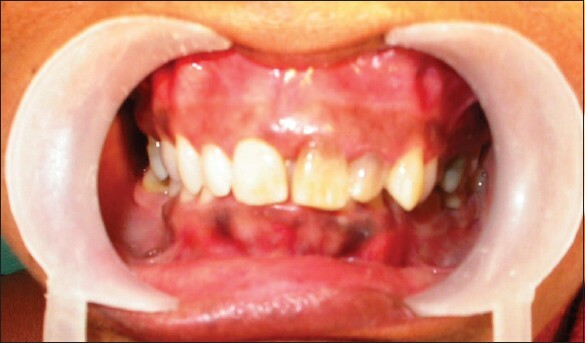 We present a case report ofa 40-year-old woman with complaint of bleeding gums and tingling sensation in fingers and toes reported to our department in March 2005 with no tangible diagnosis from previous medical examinations. Oral findings included abnormally short roots, cemental hyperplasia, widening of the periodontal ligament space and root resorption. Laboratory investigations revealed a low serum Ca level and along with the clinical findings, a diagnosis of IHP was reached. Oral prophylaxis was performed and Ca supplements were prescribed. We believe that this case report is a first of its kind reporting cemental hyperplasia, altered alveolar bone patterns and periodontal ligament widening in a patient with IHP. 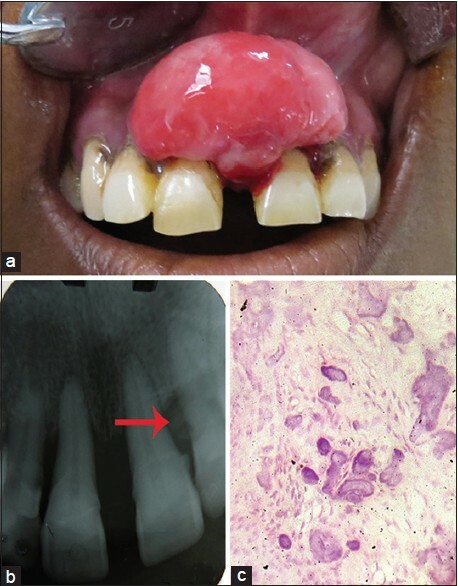 Peripheral ossifying fibroma (POF) is a reactive lesion of the gingival tissues that predominantly affects women and is usually located in the maxilla anterior to the molars. It originates from the cells of the periodontal ligament. 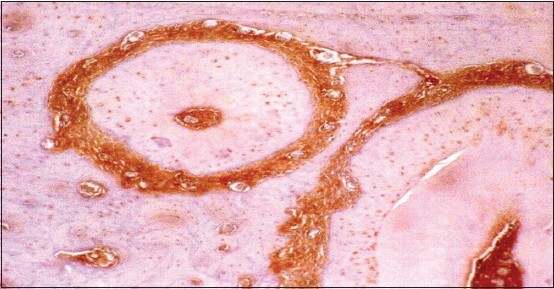 The definitive diagnosis is established by histological examination, which reveals the presence of cellular connective tissue with focal calcifications. Surgical excision is the treatment of choice, though the recurrence has been reported. We present a clinical, radiological and histological review of five cases of POF diagnosed and treated at our institute. A 75-year-old male patient was planned for dental treatment due to pain of suspected pulpo-periodontal origin in relation to right maxillary first molar. Careful evaluation revealed the pain to be non-odontogenic in nature and led to the diagnosis of temporal arteritis with rheumatoid arthritis along with interstitial lung disease (ILD). Characteristic findings of temporal arteritis include headache, jaw claudication, visual loss, and constitutional symptoms (malaise, fever, weight loss, loss of appetite). Temporal artery biopsy (TAB) remains the gold standard for diagnosis. Additional diagnostic tests include blood tests (ESR, CRP). This article reports and discusses how the orofacial manifestations can lead to misdiagnosis of temporal arteritis. Hence, temporal arteritis should be included in the differential diagnosis of orofacial pain in the elderly especially to prevent complications like vision loss.